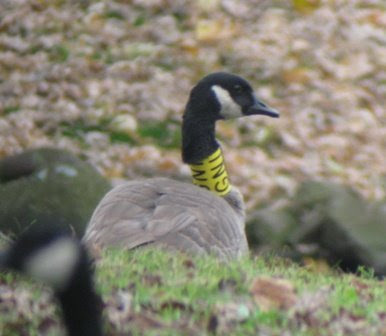 In my Barnacle Goose post from last week, I mentioned that there was a neck-banded Canada Goose within the flock. I reported the goose to the USGS website and promptly learned that the goose pictured below is an adult female banded in western Greenland this past summer. In addition to this bird, eight more neck-banded Canada's were seen and reported by Richard Becker...these 8 birds were also banded in western Greenland as part of the very same project. The circumstantial evidence seems to suggest that the Barnacle Goose is indeed wild!